When individuals search for a VPN application to meet their specific requirements, they try gaining as much unbiased information as possible. If you are an Android-user seeking a suitable provider, you might have come across the infamous privacy-focused, Panama-based provider, NordVPN. As one of the most famous privacy services in the industry, it receives quite the praise in almost all aspects. 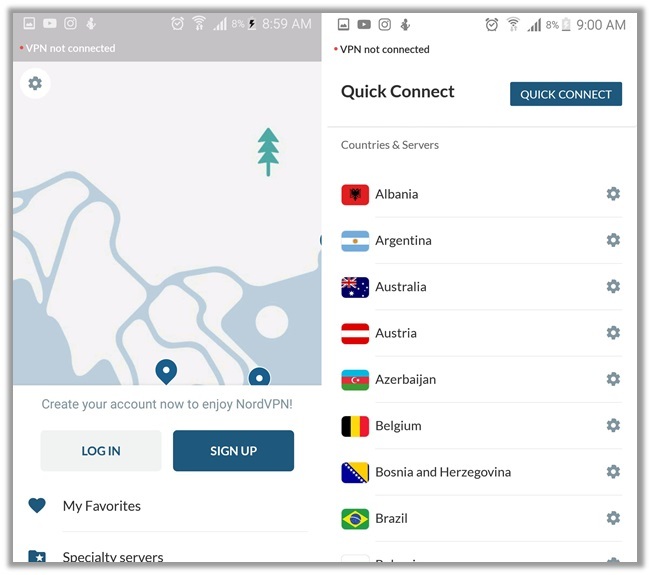 This guide focuses on the offerings of NordVPN for Android. For a more comprehensive outlook, you can even read this NordVPN Review, which took us at BestVPN.co an entire day to analyze and write-up. 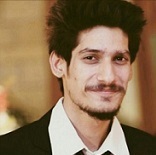 Skip Annoying Advertisements – One of the worst things about exploring the internet nowadays is the excessive loading of irritating/flashy advertisements, which constantly bug you by popping up on the screen. NordVPNs offers a CyberSec feature that automatically blocks these unwanted pop-ups, auto-play ads, and other material – allowing you to enjoy a smooth browsing experience. Blocking of ads and trackers even boost loading speeds! Protection from Viruses/Malware – With the CyberSec feature on, you can feel assured that you receive maximum protection against trackers, malware, viruses, botnet control, and other cyber threats aimed to hack your device and steal personal information. Users even receive good security from DDoS (distributed denial-of-service), cutting off communication between the control server of the botnet and the compromising asset. Security from Dangerous Websites – Though the internet has grown massively over the years, there is still a good chance for you to come across some shady/dangerous websites, which fool users into scams via phishing and other cyber threats. The CyberSec feature regularly scans website addresses against popular backlists, which keeps you secure from any phony website looking to trick you into purchasing something or revealing personal information. Protects your Digital Identity – Thanks to NordVPNs strict zero logs policy, features like DNS Leak Protection, Automatic Kill Switch, and protocols like DoubleVPN and Onion over VPN – the VPN tends to be one of the most secure services in the marketplace currently. You can feel assured that your identity remains anonymous at all times, even when unblocking VoD services or streaming pirated content via unofficial/third-party apps/SaaS. Downloading NordVPN on your Android device requires no rocket science. Users typically have two options to get the app. 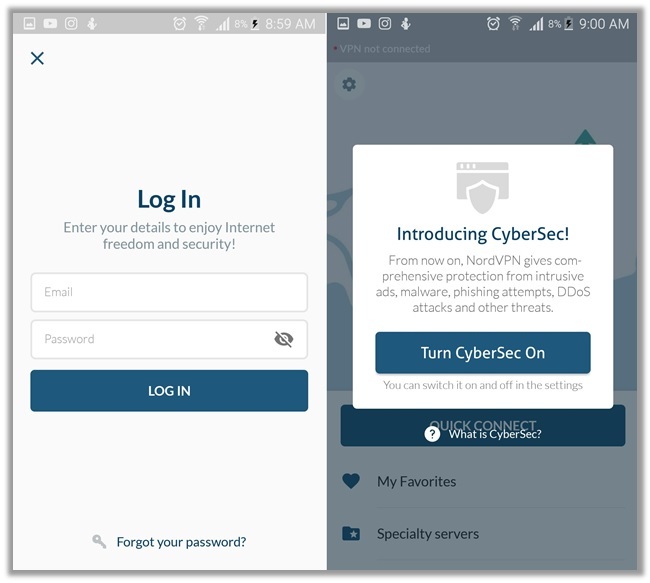 The first is to simply head over to https://nordvpn.com/download/, scroll down and click on the link for Android. The second is to visit Google Play Store, type in “NordVPN” in the search bar, and hit the “Install” button. Both processes hardly take 2-3 minutes to complete! 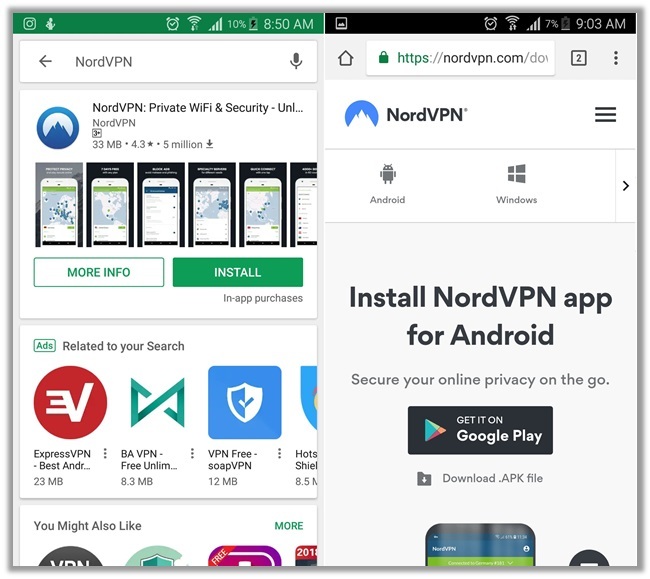 When it comes to setting up NordVPN for Android, you have two options: use the VPN service manually or via the app. Regardless of which option you go for, you do leverage the same level of security. Albeit, you have more freedom of configuring and adding extra layers of security, if you opt for the manual route. Below we will discuss both processes to make the decision-making process easier for you! Go to NordVPN’s official website and subscribe for a suitable plan. Download the Android application from the website or Google Play Store. Once installed, enter the credentials for the plan you signed up. 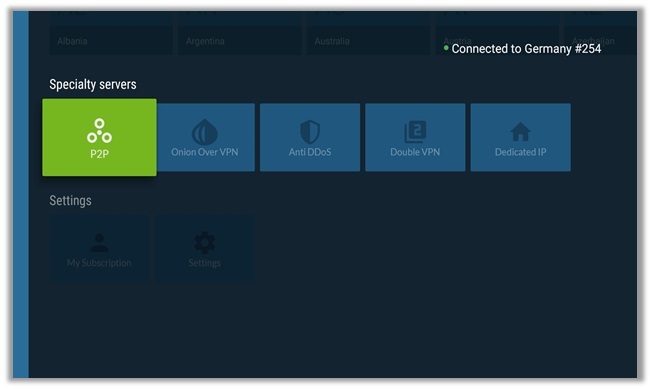 Hit the Login Button to gain access to the VPNs features. Go to settings and enable “CyberSec” for boosting protection. Open the browser and download the NordVPN .ovpn configuration files from here. 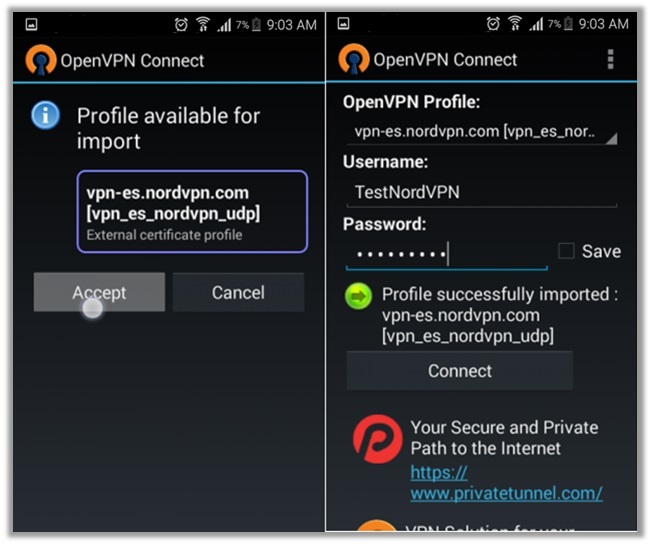 Go to the Google Play Store and Download/Install OpenVPN Connect. Once installed, launch the application and tap on the menu button. Select “Import” and find the .ovpn configuration file you downloaded earlier. Enter the username and password for your NordVPN account. Hit connect! One of the best things about signing up with NordVPN is that you can always feel assured to receive compatibility on a number of devices/hardware. Cord-cutters, binge-watchers, and movie/TV show geeks can now take a sigh of relief knowing that there is a NordVPN app for Android TVs too! It is available for download on both: Google Play Store and Amazon App Store. As one of the most prominent VPN services in the marketplace, many people look for cheap NordVPN Coupons/Deals. After performing a thorough analysis on the official website and multiple other forums/communities, we learned that currently there are no special deals available for Android. 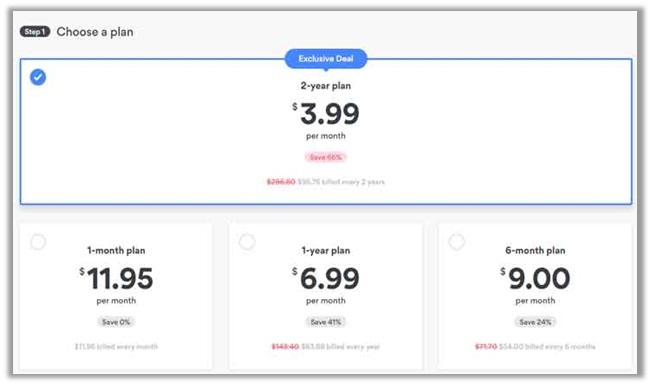 However, you can still opt for their special yearly deal, which gives you a massive discount of 41%, lowering the monthly costs from $11.95 to $6.99 (billed $83.88 every 12-months). When you use NordVPN for Android, you may sometimes come across certain errors/issues, which require assistance. Below we have discussed the common issues and their best solutions. There are many reasons as to why NordVPN for Android may not work smoothly. Internet disconnection or server unavailability on different protocols are often the main reasons though. Make sure that your internet is connected to rectify the issue. If nothing else works, consider re-installing the app. Connectivity issues could arise due to the NordVPN for Android app not receiving appropriate authentication. Make sure that you allow access to all features of NordVPN. If things still do not work, consider troubleshooting your internet connection. After spending around 3 to 4 hours assessing the performance and features of the NordVPN for Android application, it is safe to say that you do receive great anonymity and privacy online. There are plenty of features to boost your security, and the app offers quite amazing compatibility for Android TVs as well. We also conducted a WebRTC and DNS leak test, but could not find any gaps in security.